Have you been thinking about getting a new tattoo? Then you have to check out our 23 simple tattoos for women. These tattoos all feature beautiful and simple designs. You will find subtle and small ideas, cute and colorful designs and more. There is something for everyone, whether you are choosing a first tattoo or if you just want something straightforward that won’t be too painful. What are you waiting for? Take a look, you won’t be able to decide which tattoo to have next! 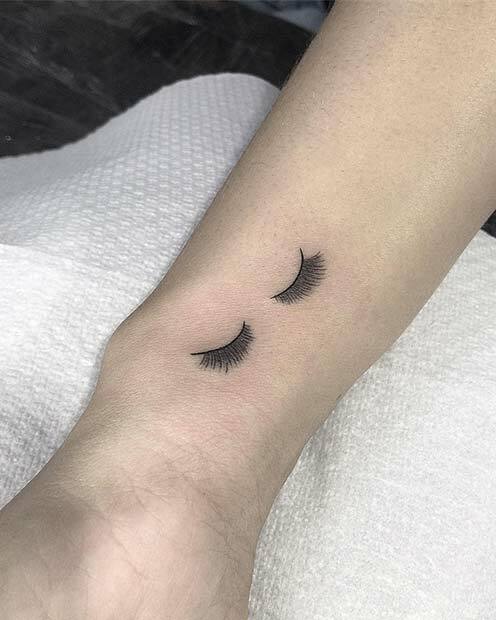 The first design we would like to show you is this pretty eyelashes tattoo. It is a simple design that features a pair of long, stylish eyelashes. A tattoo like this is great for the ladies who love makeup and beauty. It is a cute idea that will suit everyone. Love horoscopes? Then this tattoo is for you. 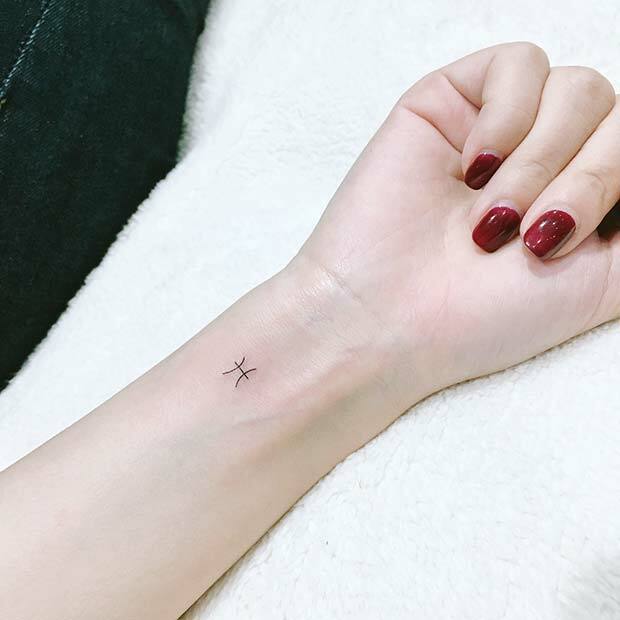 Here we have a small star sign tattoo. It is subtle, simple and stylish. You can have your star sign tattooed like featured or choose something larger. A design like this one will never go out of style and it can be tattooed anywhere. It would also make a great first tattoo, too. Next, we have a cute and pretty tattoo. This one is a black heart outline. 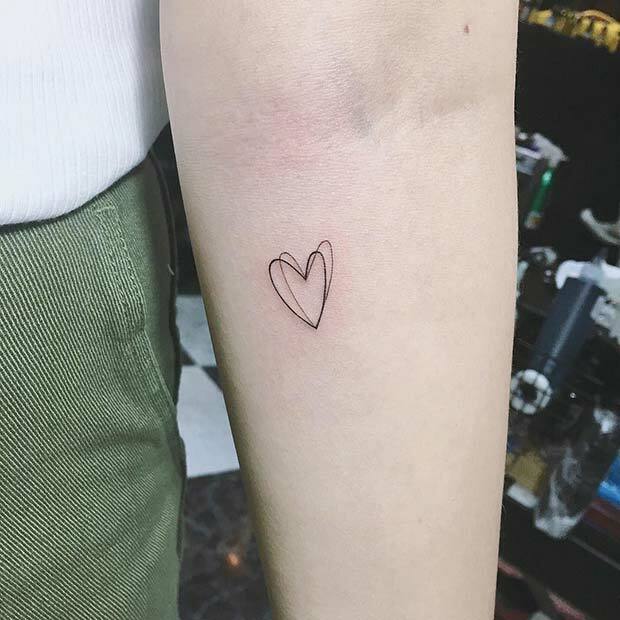 A heart tattoo would be great if you want to show you care for someone or if you just love the design. You can recreate the black outline or choose a different color. Pink or red would be lovely. Every Queen needs a crown. With our next tattoo you will never be without one! 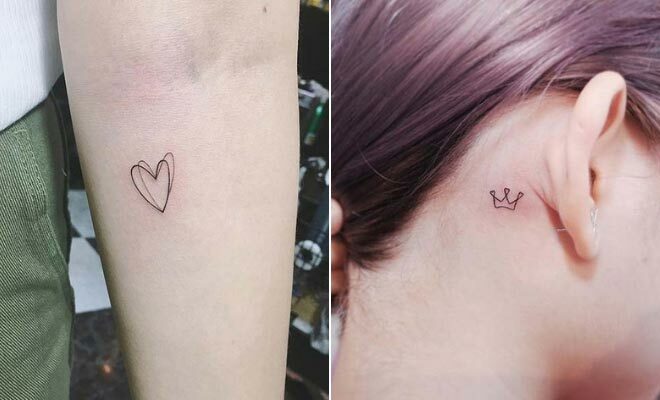 Here we have a simple crown tattoo design. 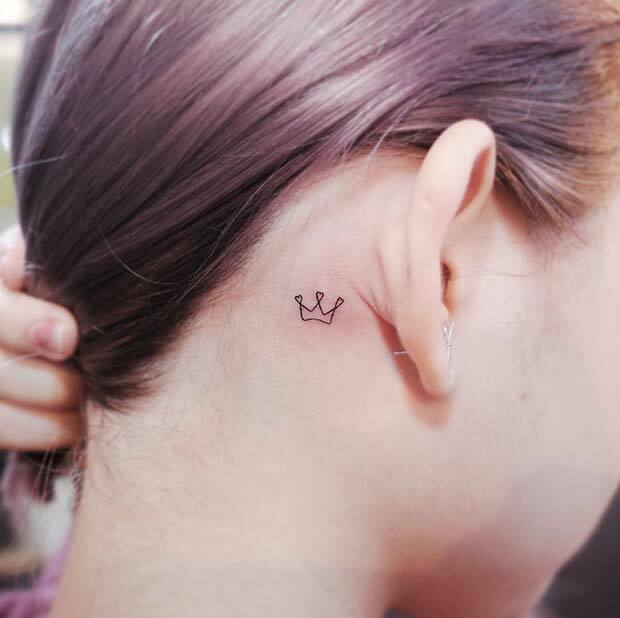 The black ink crown is small and has been tattooed behind the ear. It is a subtle piece of art but it looks stylish and you can choose to show people or cover it up. Try a similar tattoo to this or you can have a crown tattooed elsewhere. The wrist is a popular place. 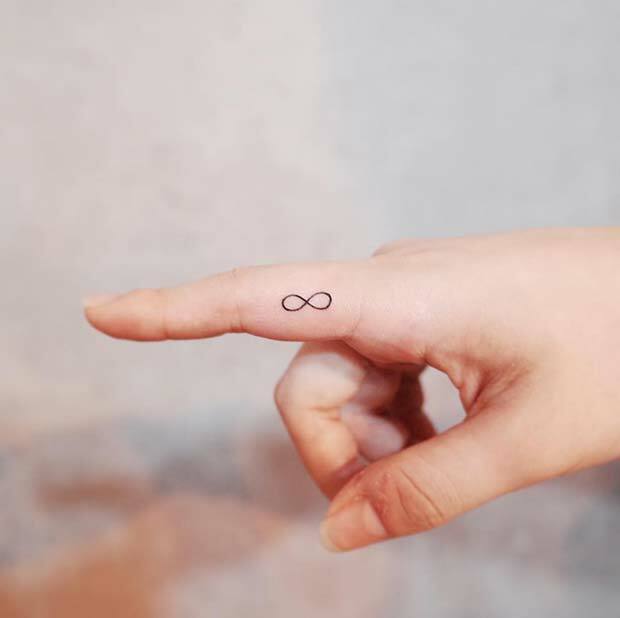 A popular simple tattoo design is the infinity symbol. This symbol can represent many different things, some common ones are endless love, never ending friendship and it can have spiritual meaning too. So, not only does it look awesome, but it can also be very meaningful. It is a simple design that will suit everyone and it can be tattooed anywhere. This finger tattoo is a stylish example, we love this design! Our next idea features a stylish lotus flower. The flower has been tattooed on the sternum and has a trendy geometric design. A geometric pattern like this is a great way to keep the tattoo simple but gorgeous. You can choose a more detailed lotus, too. Have a similar tattoo to this one or have a lotus like this tattooed elsewhere. The ankle or wrist would be a cool place. Next, we have a stylish shell design to show you. 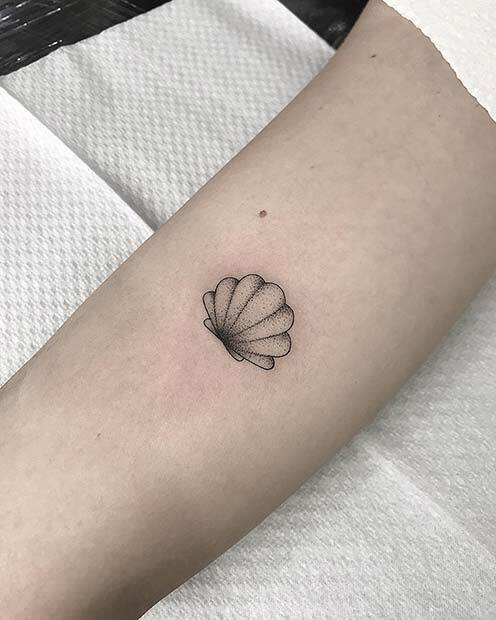 This cute shell has been tattooed on the arm. It is a simple, shaded design with a black ink outline. You can recreate this or just the have the shell outline with no shading. Either way, it will look gorgeous. A shell is perfect for anyone who loves the beach, the ocean and mermaids too! Looking for a tattoo idea with a meaningful quote? 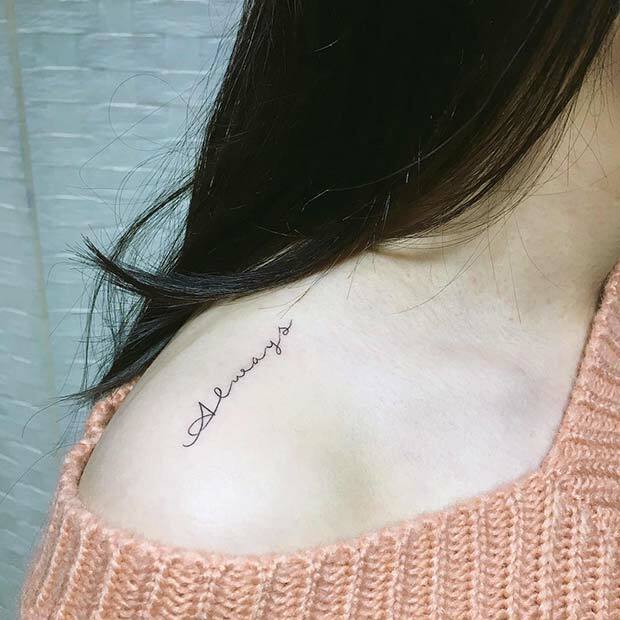 Then look no further, here we have a beautiful tattoo with the word “always”. The word always could mean that you will love someone forever or that you will never forget someone special. It is a subtle and stunning way to show you care. You can use any other meaningful word with a similar design. Earlier in the post we featured a heart outline. If you liked that idea, then you should check out this one too. This tattoo is another outline design but instead of one heart there is two. One has a dark black outline while the other is more delicate and it has a different shape. It is a cool and creative take on the classic outline. 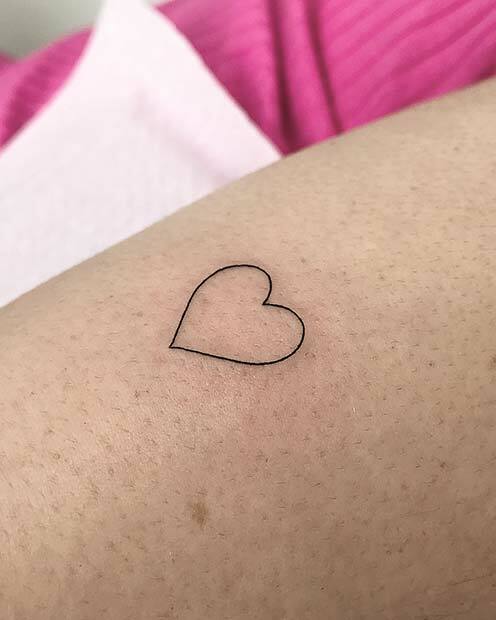 You could even have one heart in a different color to make the tattoo unique. Next, we have another tattoo idea for those who love the beach and the ocean. 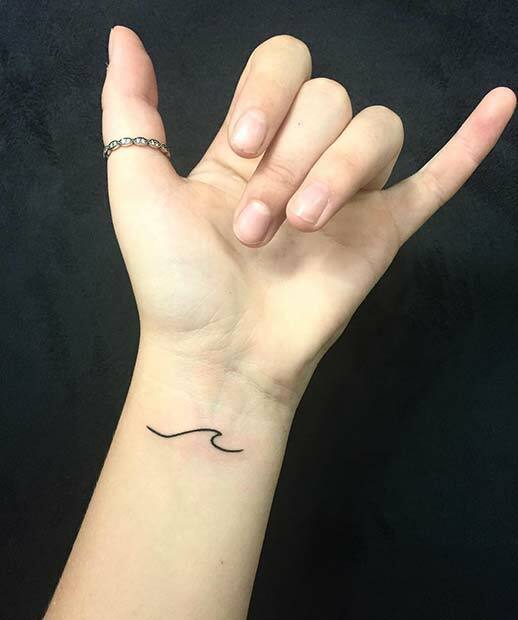 This tattoo features a simple wave design. It is a very subtle tattoo but, as you can see, it looks super stylish. Something like this would be great as a first tattoo as it is one line. Recreate this black ink design or try having a blue wave instead of black.